The first Saturday in May will be a big day for some lucky winners who may feel they have a certain force on their side at the 15th annual “Bundle of Bucks” Charity Raffle Drawing Party. An overnight getaway package at the Quality Inn & Suites Riverfront including dinner at G.S. Steamer’s Restaurant will be awarded at this year’s St. Luke “Bundle of Bucks” Charity Raffle Party. 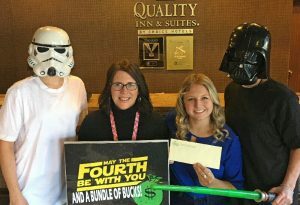 Some familiar characters are helping to highlight this year’s theme – “May the Fourth Be with You” – two of which are shown with event organizer Julie Chetney: and Quality Inn & Suites Riverfronts’ Brooke Broadwell. The “Bundle of Bucks” Raffle will award cash prizes totaling $25,000 along with a bundle of fantastic prizes like an overnight package courtesy of the Quality Inn & Suites Riverfront in Oswego. To be part of the raffle stop at either St. Luke Health Services, Bishop’s Commons or St. Francis Commons in Oswego to purchase tickets directly, or download a ticket application from www.stlukehs.com. Raffle tickets are $50 each; only one thousand tickets will be sold. The raffle features fifteen cash prizes awarded from a prize pot totaling $25,000, with a top prize of $10,000 to a lucky winner. Every raffle ticket purchased is entered in all of fifteen of the cash prize drawings. Tickets can be purchased individually or consider purchasing a group ticket with family members, co-workers or friends. Proceeds from the raffle support the St. Luke–John Foster Burden Fund; benefitting those served by The St. Luke Family of Caring; not-for-profit healthcare and residential services affiliates St. Luke Health Services, St. Francis Commons and Bishop’s Commons Enriched Living Residence in Oswego. Each raffle ticket admits two adults to the Bundle of Bucks Raffle Drawing Party taking place May 4 from 1 – 4 p.m. at the Elks Lodge in Oswego. The raffle drawing event features an afternoon of free food, beverages, live entertainment by Jimmy D and the Jury, games and prize drawings. You do not have to be present at the raffle drawing to win.